A major road in Leeds was closed for several hours after following the discovery of suspected mortar shell. Crown Point Road was cordoned off due to reports of a "suspected First or Second World War mortar device", West Yorkshire Police said. 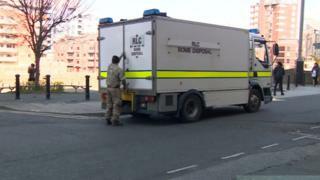 The Army bomb disposal team carried out a controlled explosion of the device at East End Park at about 16:30 GMT. It was believed to have been discovered by people fishing with magnets nearby in the River Aire. The road reopened at about 16:00 GMT.